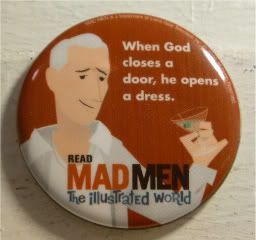 Yep, another one of my Mad Men: The Illustrated World pins magnets that I picked up at New York Comic-Con this year. I'm using it today for a couple of reasons, mostly because ya'll know I'm supertotally picking up Sterling's Gold this week. How could I not? If it's anything like Kendall Hart's Charm! or Richard Castle's Heat Wave, it'll totally hit the New York Times list. Although, I will cry if it's as bad as the excerpts that Don overheard on the show. Let's hope Roger's ghostwriters did a great job. One thing's for sure, Roger would be pleased as punch that as an ad girl 12 years in the business, I haven't read David Ogilvy's Confessions of an Ad Man and I haven't read Bill Marsteller's Creative Management (I own it, so that kinda counts, even though they used to give it to all Marsteller employees.) but I'm about to read Sterling's Gold. Boy. I can't wait for Don Draper's book to come out. Hah! I totally forgot the whole reason I decided to do this magnet this week in the first place. It's because I saw John Slattery's Lincoln MKX ad. Nice to see him in it, cuz he's purty, but it probably wasn't a good thing that I thought it was a very nice companion piece to Kate Walsh's Cadillac spot a couple of years ago. Oops. i like that lincoln ad. he's pretty. have you heard any don draper mercedes ads? i heard he's the voice now but i haven't seen any.